So is Kirkland a hero or a bandwagon? I’d offer he is both. Having wrestled with some very tangled historical issues over the decades (rarely is any event or historical question framed in anything but mud), the progression of evidence in Kirkland’s case seems fairly straightforward. First, we know that one or more Confederates went over the wall to aid the Union wounded. Second, we have been given the name of one of those men: Kirkland. Is there really any basis for doubting Kershaw’s statement about this? Why would we? Certainly, if we’re using an evidentiary scale here, the evidence that would discredit Kershaw’s statement is far, far weaker than the evidence that suggests his statement about Kirkland is in its fundamentals (if not details) based in some fact. It seems to me that in dealing with these things, it’s vital to distinguish the event (or story) itself from the way that story has been used. There is no doubt that Kirkland became a bandwagon, and there is no doubt that his story, as relayed by Kershaw, other veterans, later historians, and (especially!) artists (see here here here here here) became a stone in the foundation of the Lost Cause, used to demonstrate the virtue and humanity of the Confederate soldier (even, recently, to the point of reducing the battle itself to insignificance in some eyes). But, Kirkland’s status as a Lost Cause icon does not render his story untrue (just as the slave auction block’s imagined threat to Southern virtue has little to do with the evidence that speaks to its historic use). As Gary Gallagher points out, the Lost Cause endures because enough of it is based in fact to make it arguable (at least to some). 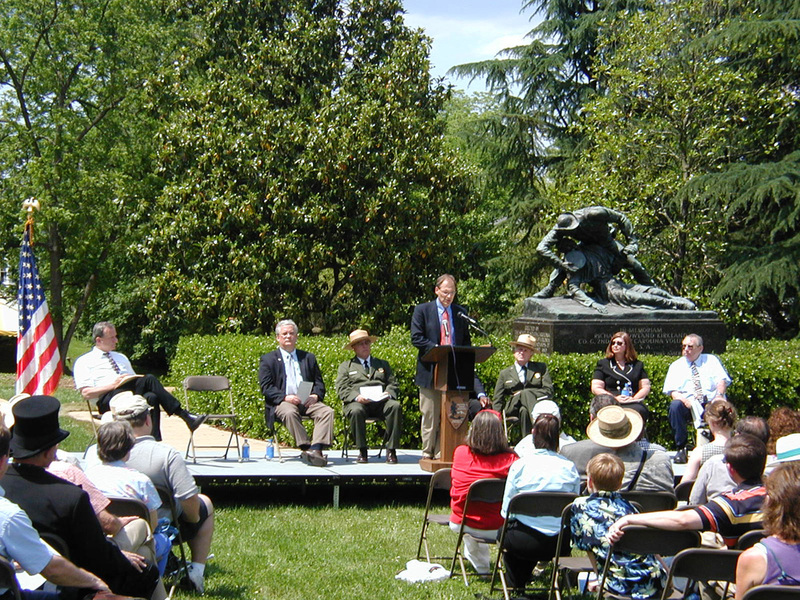 With the Kirkland Memorial as a backdrop, Historian George Rable speaks at the 2005 dedication of the restored Sunken Road. 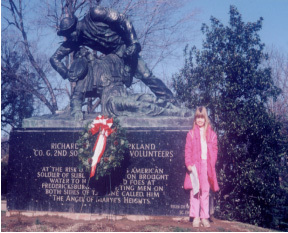 Let’s pass the Kirkland legend and monument to the realm of public history. It’s a classic case of public historians being buffeted on one side by the emerging and growing historical record and on the other by the force of tradition. What do we do with it? In fact, historians at the park for years have been acutely aware of the vagaries embodied by the source material. While we largely accept the essentials of the Kirkland story, we are also quick to discuss the uncertainties that surround it and, significantly, the cultural values that have overlain it—the use of the story for cultural, political, and social ends. (Michael Schaffner’s piece at Civil War Memory is a highly useful cautionary note on this account). And know too that if evidence emerges that disproves the Kirkland story, we’ll lead the way in shifting our interpretation away from the event itself and to the creation and use of the story as a stimulus for postwar reconciliation and sustenance of a Southern identity. But the evidentiary standard for demolishing legend must necessarily be high. With Richard Kirkland, that standard has not been met. The story is due careful handling and a great deal of context, but not (at least now) outright reconsideration. And, for the diligent one of you who might some day turn up a body of evidence that forces a reconsideration or rejection of the story, bear in mind that a greater understanding of history does not always portend the revision of memory (as those of us in the history business have learned the hard way). An interesting discussion, but perhaps a bit limited. The Kirkland story purportedly occurred on December 14th, in daylight. According to the accounts provided here, though, it is clear that some Confederates were over the stone wall during the night of December 13/14. Again, according to the accounts, some of them were a bit rough with the suffering Yankees, but others attempted to provide some level of relief. From other accounts we know that Confederate troops stripped some of Union dead for clothing. On a cold winter night, who could blame them. Though no one has said so, it is conceivable that some of the clothing was stripped from soldiers who were not quite dead, which of course comes across as brutal (unless one was there and exposed to the weather and more worried about survival instead of posterity). In the sentimentality of late nineteenth century reconciliation, who would want to bring up unpleasant details? A heroic Confederate, instead of freezing and callous troops was surely a better story. I do not have specific evidence that this occurred, except for the Union dead being stripped of warm cloths, but if we are to discuss history, we need to handle evidence carefully. It is not so much what someone wrote or said. Anyone can write and say pretty much anything. The historian has to figure out why something was written or said. 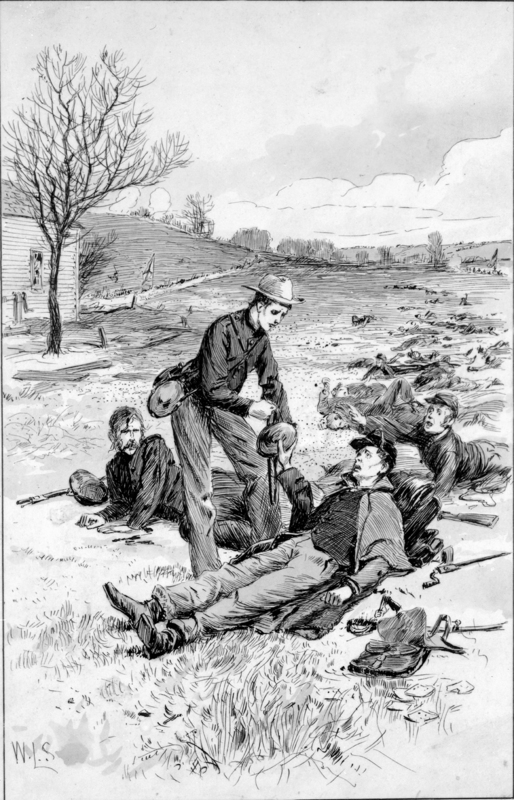 There should be no question that some Confederates tried to relieve the suffering of wounded men, but we ought not to assume it occurred in broad daylight or under fire. There was undoubedtly pillaging and theft by Confederates on the dead and wounded in front of the stone wall, but that was not the point of this article. My purpose was simply to state the evdience I have found on the Kirkland incident as a growing number of people are questioning whether the Kershaw story of Kirkland’s activites was a fabrication. The evidence overwhelming supports Kershaw’s story of Kirkland’s humanitarian efforts, but the evidence also strongly suggests that there may have been others. A friend of Private Rentz states that Rentz assisted Kirkland. There is also an account of a Georgian and one of either a masculine looking women or male soldier dressed as a woman providing assistance to wounded Union soldiers in front of the stone wall. Your interest in other things going on in front of the wall which are less virtuous is worthy of another discussion. I don’t think we can separate the pillaging from the humanitarianism when discussing the Kirkland story. As historians, we always need to examine the motive behind whatever evidence we have. What went on in front of the stone wall was not something that all of the participants were going to be proud of. It is also pretty typical to put a veneer on war’s ugliness, after the fact. There was often more sentiment than reality in what many folks wrote about in the late nineteenth century and that context makes our twenty first century discussion more difficult. Peter: I don’t disagree. Clearly the Rentz story is a minor thread in all this. But, with so few threads available, it’s worth looking closely at every one. You are correct, it all comes down to Kershaw… John H.
I think I’d give more credence to the latter Kershaw if he didn’t sound so little like the first, and so much more like a Carlyle McKinley. The story-telling tone holds right down to the repeated third person references to “the General” rather than “I.” It strikes me as telling that even Kershaw’s letter doesn’t sound like a first-person account. But that’s basically all we have. – To fulfill the organizational requirement that a unit’s actions be documented. – To present the activities of that unit or its commander in the best possible light. – To promote the qualities that were vital to the success of the organization. I have spent much of my adult life working with a heavy mix of official records and personal accounts. There are hundreds, thousands of stories of valor–some of them incredible–that gain no mention in official reports. Read O’Reilly’s Fredericksburg, or my Second Manassas, and look at the sources as they relate to stories of valor and humanity (Kirkland would have qualified on both accounts). Rarely are they derived from the Official Records. Moreover, when such stories do emerge from the ORs, they almost always reflect acts of valor, not humanity. Commanders had an organizational interest in noting and promoting acts of valor. They had little organizational interest in promoting stories of humanity in their official reports. They were not historians trying to capture a full range of events. They were purposeful recorders of a very narrow view of an event, intended to serve the needs of the organization. That Kirkland doesn’t appear is typical. If he had, it would be highly unusual. More than that, think about the context within which Confederate officers wrote their post-battle narratives at Fredericksburg. The South was in a state of uproar over the bombardment and looting of the town by the Union army. Arabella Petit of Fluvanna County, for example, declared to her spouse, “Shoot them, dear husband, every chance you get.” It was not an environment where any officer was likely to see personal or organizational advantage in identifying and promoting one of his soldier’s compassionate acts toward a member of the Union army. This is not to offer up any conclusion on Kirkland (my argument here makes it no more or less likely that the story is true). But if we’re going to look at the environment that might have helped shape a narrative of valor in 1880, we need to also recognize the environment that would have discouraged the telling of the same story in December 1862. I don’t disagree, but we can imagine plausible reasons for a change. After the first articles, relatives of Kirkland might have talked to Kershaw, and asked him why didn’t you include the story of Kirkland? Maybe Carlyle McKinney had collected from a local person a story about Kirkland, and Kershaw offered “yes, I remember a soldier giving water to the wounded” and then McKinney wrote it up from there. Basically, I think there is no good reason to believe Kershaw, but no good reason to call it a fabrication (or even that Kershaw misremembered). I’d have to say that the lack of any corroboration before the initial story (one that refers to Kirkland by name, or even letters of soldiers trading these stories and suggesting that it might have been Kirkland, either contemporaneously or near-contemporaneously) raises my suspicions enough to not repeat the story as fact. Which is all to say that I more or less agree with you. 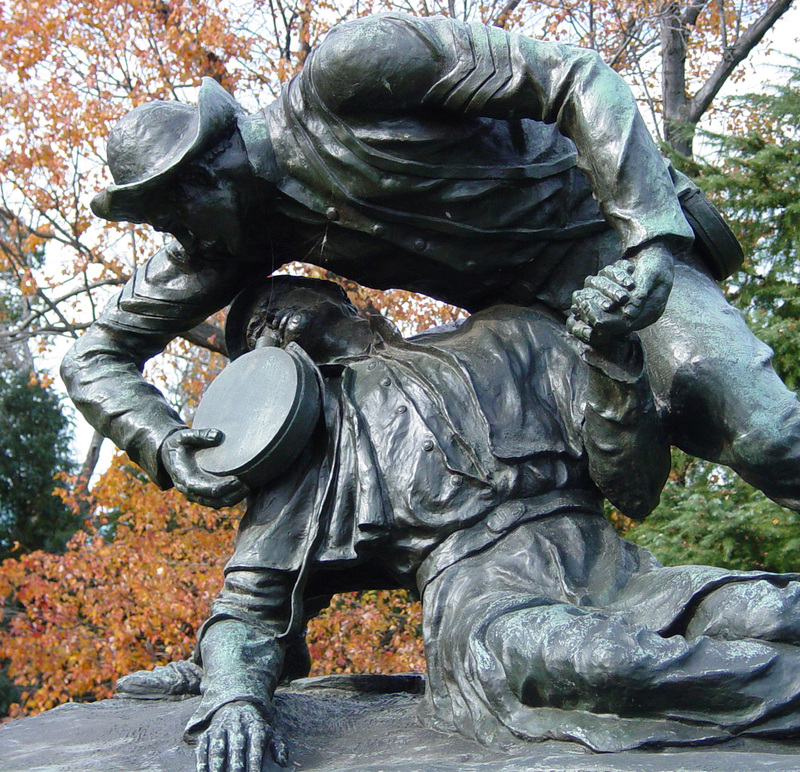 True, individual soldiers get mentioned most often for “acts of valor, not humanity” but Kirkland’s valor (“At the risk of his life…” the statue’s inscription begins) is what elevates his story above, say, Whitman’s middle-aged Samaritan with the biscuits. Along those lines it may be worth notice that the AAR of Colonel Kennedy of the 2nd SC does name a number of officers as well as two enlisted orderlies, but no Kirkland. De Saussure mentions his own medical staff, and chaplain, and Buchanan notes the sacrifice of his hospital attendants, but again, no Kirkland. More important, Kershaw’s letter has an hour and a half (half the winter afternoon) devoted to an impromptu cease fire while Kirkland carries out his ministrations. None of the after-action reports, north or south, mentions any such thing. While the humanity of one man might not deserve official mention, a significant halt in the action would. In fact the northern accounts universally describe the fire as constant, and Kershaw’s own report notes with satisfaction the infliction of another 150 casualties on the enemy. Peter, thank you for your essential agreement. I regret that I allowed the word “fabrication” to slip into my posts. Having spent most of the last half century studying European warfare, and only coming to our own civil war in the last decade, I confess that I did not appreciate the emotional power that this story holds to this day. “Legend” seems to me a better word, because it allows for some factual basis and does not cast the same aspersions on those who believe the story. But better still might be “barracks room tale” – the term Delbruck used for a wealth of other good war stories told across the water. Every country and every war has them (your earlier reference to the Angel of Mons did not go unappreciated), and I should not be surprised that we are so fond of our own.